Greenland’s ice is not only melting in at a much higher rate than previously thought, but in a way that is invisible to the naked eye, according to new research from NASA. Scientists from NASA’s Jet Propulsion Laboratory (JPL) and the Greenland GPS Network (GNET) have discovered that massive ice loss at the Rink Glacier on the country’s west coast was aided by a gigantic underground ‘wave’ that lasted for up to a third of the year. 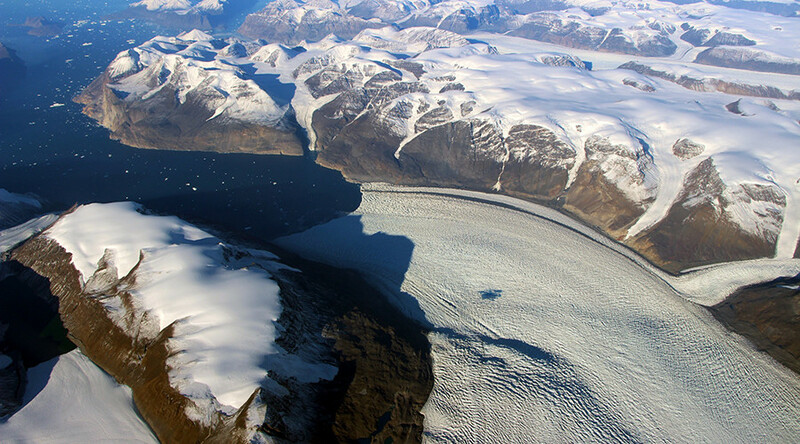 The NASA team used the GNET tracking observations to examine the glacier as it lost mass during the country’s hottest summers on record – 2012 and 2010. Ice slid through the glacier's interior in a huge wave for four months, with ice from upstream repeatedly shifting down to replace the missing mass. All of this remained undetected until now. "You could literally be standing there and you would not see any indication of the wave," said JPL scientist Eric Larour, the study’s co-author. "You would not see cracks or other unique surface features." The Rink Glacier typically flows at a speed of a mile or two a year. However, during the period between June and September 2012, the wave moved through the giant ice block at a speed of about 2.5 miles (4km) a month for the first three months, increasing to 7.5 miles (12km) during September. The same wave pattern was detected in GPS data for 2010 – the second hottest summer on record in Greenland. "We know for sure that the triggering mechanism was the surface melting of snow and ice, but we do not fully understand the complex array of processes that generate solitary waves," said JPL scientist Surendra Adhikari, who led the study. “This systematic transport of ice in fall to midwinter had not been previously recognized,” Adhikari added. One theory is that a series of processes combined to make the mass move quickly. For example, the huge volume of water ‘greased’ the glacier base, allowing ice to shift more rapidly. In the early 2000s Greenland lost on average 11 billion tons (gigatons) of ice per year. However, during the hot summer of 2012, where more than 95 percent of the surface snow and ice was melting, it lost an additional 6.7 gigatons of mass. The team says the intense melting of 2010 and 2012 is without precedent, but is representative of what we can expect “in a warming climate." There are more than 50 GNET stations mounted on bedrock across Greenland’s coast to track changes below Earth's surface. The discovery was only found as the JPL scientists were assessing the scientific benefits of keeping GNET going. The stations are not currently being maintained by any agency. Details of the finding have been published in the journalGeophysical Research Letters.